Each and every customer means so very much to us! That's why we have created the Loyalty Rewards Program. It's our way of saying "Thank you!" to all the schools who have asked us to come back and visit again and again. We really appreciate it when you invite us to bring the AstroDome to your school. And when you invite us back again the following year, it really is quite an honour! The schools in the list below are eligible to receive a loyalty reward during the 2018 - 2019 school year. Here's how the AstroDome Planetarium Loyalty Rewards Program works; if the planetarium comes to your school two years in a row, you are eligible for the Bronze Star Reward (10% OFF Admission Fee) in the second year. If the planetarium comes to your school three years in a row, you are eligible for the Silver Star Reward (15% OFF Admission Fee) in the third year. If the planetarium comes to your school four years in a row, you are eligible for the Gold Star Reward (20% OFF Admission Fee) in the fourth year. The Gold Star Reward is also applicable in the fifth year and all subsequent years, as long as the planetarium keeps coming back to your school year after year. Please note that there are maximum reward amounts and other important details too. So please be sure to read the fine print located below. The maximum reward amounts were increased on September 1, 2018.
Who is eligible to receive a loyalty reward in 2018 - 2019? The following schools are eligible to receive a loyalty reward during the 2018 - 2019 school year. The total amount of rewards that will be distributed remains to be seen, but the maximum amount is in excess of $3400. Schools that are eligible for the Bronze Star Loyalty Reward can book their next AstroDome Planetarium school visit beginning June 1, 2018. AstroDome Planetarium bookings for schools not listed on this webpage begin on June 15, 2018. Schools that are eligible for the Silver Star Loyalty Reward can book their next AstroDome Planetarium school visit beginning May 15, 2018. Schools that are eligible for the Gold Star Loyalty Reward can book their next AstroDome Planetarium school visit beginning May 1, 2018. ‡ Eligible until 2019-2020, as per The Fine Print regarding schools with combined grade 5/6 classes that teach Sky Science every other year. The Loyalty Rewards Program only applies to the Admission Fee. It does not apply to the Travel Cost, Administrative Fee, Accommodation and Meals, nor any other fee. The maximum reward amounts are as follows; Bronze Star ($40), Silver Star ($60), and Gold Star ($80). The Loyalty Rewards Program can not be combined with any discount coupon or special promotion, unless the coupon or promotion specifically states that it can be combined with the Loyalty Rewards Program. Schools that have combined grade 5/6 classes AND who therefore teach the Sky Science unit every other year can participate in the Loyalty Rewards Program. If this applies to you, please ask for further information. 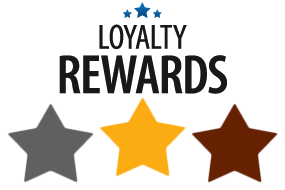 ​The Loyalty Rewards Program began on December 1, 2015. The program was modified on September 1, 2016. The maximum reward amounts were increased by 33.33% on September 1, 2018.